This publication expands upon the Australian War Memorial brochure G for George, written in 1981 by Peter Burness, Head Curator of Military Heraldry and Technology at the Memorial. It aims to give the reader some insight into a remarkable story, which follows this aircraft from England and Germany across the world to Australia, where it flew as a fund raiser and morale booster for the folks back home. 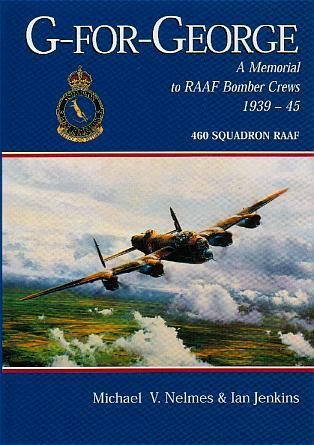 It is the story of just one of the thousands of Lancasters that played there party in winning the war in Europe. All those who have seen it on display in Canberra are struck by it's huge, black presence. George remains an icon for Australians, not because it was seen as particularly special in its time (although it was), but because it has survived as a tangible reminder to us of that time. It was there: it flew over Europe in the desperate air battles from late 1942 to 1944; it bombed Berlin, Essen, Frankfurt; it was shot at and hit by enemy guns. Fear, sorrow, anger and elation were felt by the diverse range of personalities who coexisted within its fuselage. And were it not for blind chance and the skill of its crewmen and those who maintained it, it would have gone down to destruction, as did thousands of others. They were a brave lot: Or the Australians alone, Some fifty of those who flew operations in George were awarded the Distinguished Flying Cross (including three twice over), some twenty the Distinguished Flying Medal, and several received both. Two were awarded the Distinguished Service Order as well as the DFC. As a morale booster, George itself was (unofficially) awarded the DSO, Conspicuous Gallantry Medal and DFM. But they were also ordinary men, who had volunteered for service and found themselves in an extraordinary time and place. They wrote letters home which spoke of a bright future, made touching and tragic, when for some families back home, the letters stopped; in their place, an official telegram from the war office. They played pranks and got drunk at the local English pubs. Many had not driven a car, but were expected to put an over-laden four-engined bomber into the air and bring it safely home. Many had not voted, but were ordered to drop bombs on densely populated cities, endangering their own lives, while the lives of six other friends or strangers depended just as surely on their actions. George's wartime role, to play its part in the defeat of Nazi Germany and then to bring to Australia the message that the war was winnable, has been replaced. Its four Merlin engines are un likely to splutter into life again. Today it serves more silently as a stepping stone to contemplation of the deeds of those who served, especially the tens of thousands of aircrew who died in the Allied bombing campaign. 3,500 RAAF men died while operating with RAF Bomber Command. 460 Squadron RAAF alone lost 1,018 men, and 200 aircraft in three years of operations.